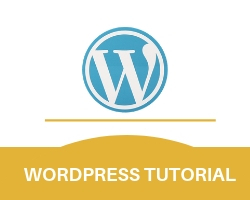 What is comment in wordpress ? A comment can be said as thoughts or views. 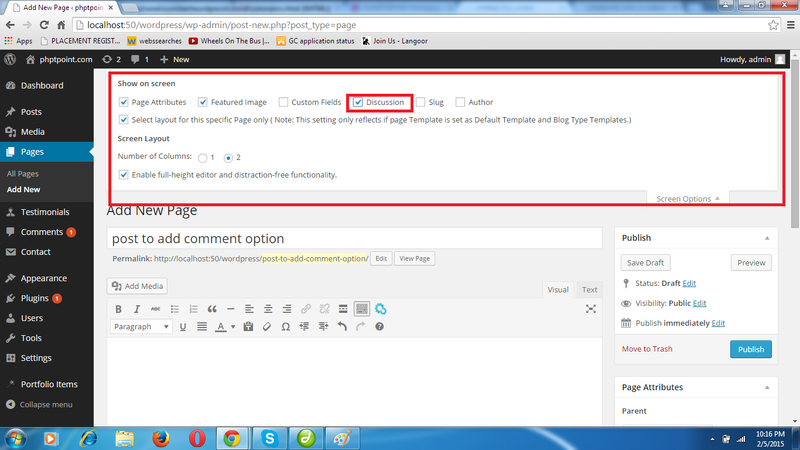 Allowing comments option to the website allows viewrs to share their thoughts and views with you and other users of your website. comments option can be added to page, post or both as per your need. Step3.Fill the form to create new post, when the form is filled then click on screen options on the top-right corner of the screen. A. A window will pop-out. Step 4. Check(select) the discussion option on popped out window. Step 5. Scroll down the screen. Check the Allow comment & Allow trackbacks and pingbacks on this page. Step 6. Scroll up the screen and click on publish button from publish window. Step 7. To see that comments option is added to the post or not, click on view post on the top left of the screen. It will show the comment block or leave a reply block on your post. Step 1. Go to Post option. Step 2. Click on all post. All post page will open. Step 3. click on edit for the post to which you want to add comments options. Step 5. Check(select) the discussion & comment options on popped out window. Step 6. Scroll down the screen. Check the Allow comment & Allow trackbacks and pingbacks on this page. Step 7. Scroll up the screen and click on update button from publish window. Step 8. To see that comments option is added to the post or not, click on view post on the top left of the screen. It will show the comment block or leave a reply block on the post. Step 1. Go to page. Step 2. Click on new Page. Step 3. Fill the form to create new page, when the form is filled then click on screen options on the top-right corner of the screen. A window will pop-out. Step 7. To see that comments option is added to the post or not, click on view Page on the top left of the screen. It will show the comment block or leave a reply block on the page. Step 2. Click on all page. 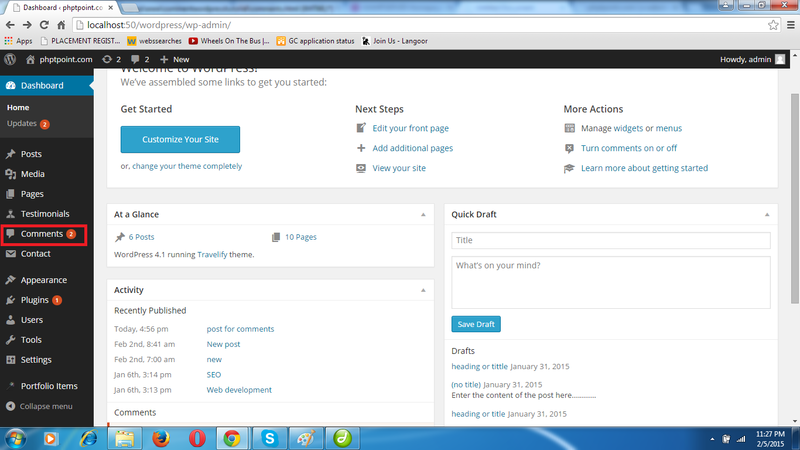 Step 3. click on edit for the page to which you want to add comments option. Step 5. Check(select) the discussion option on popped out window. Step 7. Scroll up the screen and click on update button on publish window. Step 8. To see that comments option is added to the page or not, click on view Page on the top left of the screen. It will show the comment block or leave a reply block on the page. NOTE: When any user comments on the post or the page then it isn’t visible directly to the other users. It is saved in all comment window. Admin has the authority to approve, edit, reply or delete the comment. When the admin approves the comment then it becomes visible to other users also. Step 1. 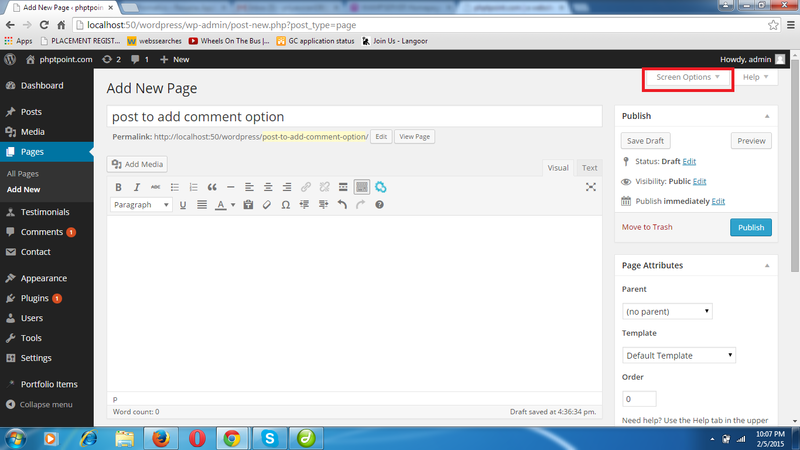 Go to comment option in the left bar of dashboard and click on that. All comment window will open. Step 2. Bring the cursor to the comment on which you want to perform any of the action like approve, edit, delete or reply and click on the option you want to perform to that comment. 1. click on ‘approve’ to allow the comment’s visiblity to other users. 2. click on ‘reply’ to reply to the user who wrote that comment. 3. click on ‘quick edit’ or ‘edit’ to edit the comment. 4. click on ‘trash’ to delete the comment.